Until now, VR developers had to use outside editing tools. Epic promises this will be more efficient and intuitive. Virtual reality content makers, from independent teams to large groups of professionals working on seven-figure projects, will soon be able to develop their work in VR. For years, Epic Games’ Unreal Engine has been the go-to tool for building video games, and along with Unity, has also been at the heart of designing virtual reality content since the earliest days of Oculus. But those developing for VR always had to do much of their editing work on 2-D monitors, using a mouse and keyboard to tweak and manipulate the worlds they were creating. The Unreal Engine in action inside VR. Today, Epic announced that Unreal Engine is adding support for building and editing virtual reality content inside VR, meaning developers can keep their headsets on and do much of their design work immersed in the tool and manipulating content with 3-D motion controllers. 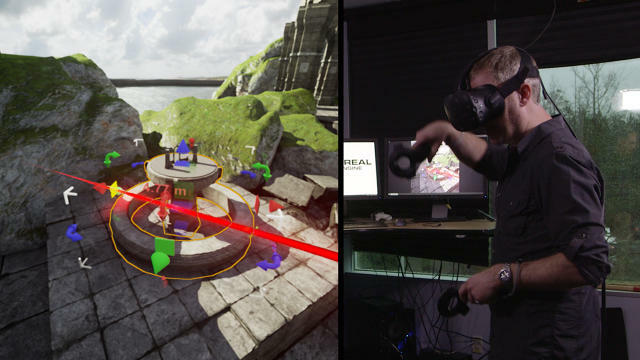 At its essence, Unreal Engine’s new inside-VR editor offers developers what-you-see-is-what-you-get functionality, allowing them to reach out and grab objects, move them around, and place them where they want them to go, Epic Games CEO Tim Sweeney told Fast Company in a phone interview, all in a much more natural way than has been possible before using traditional CAD software. The real benefit, Sweeney and Fricker said, is that the new version of Unreal Engine will make VR content development far more efficient, letting content builders save significant amounts of time by not having to constantly go back and forth between VR environments and CAD tools. Sweeney said he feels that the new approach is “the most revolutionary in content creation” since he created the original Unreal editor in 1996. Fricker noted that because the new editor offers WYSIWYG functionality, developers can scale their content easily with their hands, using simple pinch-and-zoom motions familiar to anyone who has used an iPad or similar device. With one motion, he added, it’s possible to change the scale of a VR scene in development from human size to Godzilla size. Those who closely follow the VR industry have already seen hints of this kind of content creation in tools like Oculus’s Medium, and Google’s TiltBrush, both of which are VR sculpting programs that allow users to easily create 3-D objects using hand controllers for the Oculus Rift or HTC Vive. Oculus also recently unveiled Quill, a VR painting tool it used to develop its new short film Dear Angelica.